The Funding for Lending Scheme (FLS) is churning out consistently positive results. We’ve been tracking the FLS for some time, with a particular interest in comparing the impact of its participants’ small business lending with the impact of the many peer-to-peer business lenders. The 2014 numbers made for depressing reading, with net lending to SMEs under the FLS falling quarter by quarter, amounting to a net decline of approximately £2 billion. Peer-to-peer lenders went some way towards plugging that gap – facilitating a total £967m in SME lending in 2014 – but could not hope to close it up completely. It’s worth offering the up-front caveat that we only pit peer-to-peer lenders against FLS participants in these analyses. We do not capture the data of direct lenders – like Liberis and Fleximize, nor do we capture Zopa and RateSetter’s SME lending figures (and commercial lending now accounts for 40% of the latter’s lending). In short, the credit environment for UK SMEs is unquestionably rosier that the picture that our analysis presents. But the comparison nonetheless remains a decent barometer of the ease with which small businesses are able to access finance. The Q3 2015 FLS numbers are positive, and they extend an encouragingly successful stretch for the scheme. Net lending to SMEs by FLS participants increased by approximately £700m (£675m to be exact) during the quarter. That’s the largest positive movement in FLS funding since we began tracking the scheme in Q1 2014, and it brings the net increase in SME lending for 2015 to £1.765bn. Blending together the contributions of both FLS participants and peer-to-peer business lenders, we determined that our balance at the half way point of this year (since the start of 2014, factoring in only the shifts in FLS funding and the contributions of the alternative business lenders) stood at £763m. 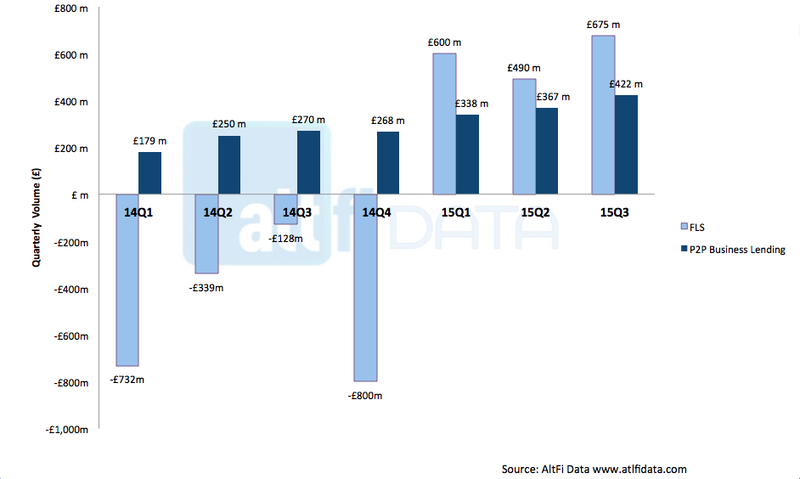 Add to that total the extra £675m of FLS lending from Q3, and the £422m of peer-to-peer lending for business that was transacted in Q3 2015 (according to AltFi Data), and that balance climbs to £1.86bn. Time for SMEs to rejoice? "Whilst the Funding for Lending scheme has helped, take up has not driven substantial increases in net lending because it doesn't solve the cumbersome bank lending process. New forms of innovative finance are growing exponentially however, as they offer a fundamentally better all-round experience to small businesses."